Although the 40-day period of Lent is meant to be a time of penance and fasting, one of the guilty pleasures of the season is savoring the wonderful culinary specialties Mexican cooks whip up only at this time of year. By far the most popular and satisfying of all Lenten taste treats is capirotada de vigilia, a sumptuous south-of-the-border version of bread pudding. Essentially capirotada is a layered concoction usually composed of toasted slices of bread, syrup enhanced with spices, fruits and nuts. But like nearly all “traditional” recipes, ingredients and cooking techniques are quite varied according to family customs and personal tastes of the chef in charge. 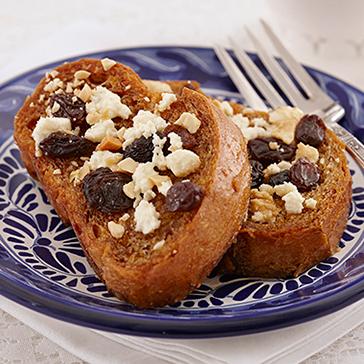 A classic capirotada is made with bolillo rolls, similar to the French baguette, piloncillo (unrefined brown sugar cones) melted into a dark treacle infused with cloves and cinnamon sticks, raisins, peanuts and a cheese topping. Some cooks flavor the syrup with tomato and onion. That may seem odd for a dessert recipe, but it boosts the umami factor. Others add prunes, dates, chunks of plantain, apple, guava and other fruits, or substitute pecans, walnuts, almonds or pine nuts for the peanuts. Different types of fresh or aged white cheese may be selected for the salty component. A sweeter interpretation is capirotada blanca, using similar ingredients plus a dose of fresh or condensed milk. Modern day gourmet cooks may go out on a limb with more exotic ingredients and fanciful presentations. Old-school cooks prepare the pudding in a large clay cazuela lined with tortillas, put over a low flame on the stovetop. Others prefer glass or metal casseroles and oven baking. Like so many creative endeavors in this country, capirotada is embued with deep symbolism, related in this case to the Easter season. The bread represents the Body of Christ and the syrup his spilled blood. Cinnamon sticks are reminders of the wooden cross, the raisins its nails. The melted cheese stands for the Holy Shroud. Lakesiders will have a unique opportunity to see and sample multiple manifestations of the dish at the second annual Feria de la Capirotada, scheduled for Sunday, March 13, 3-8 p.m., at the Ajijic plaza. There will be places for up to 50 participants to show off their culinary talents. Prizes will be awarded to the best cooks, including those scored by a panel of knowledgeable judges and the ones selected by People’s Choice votes. For full details call 33-1706-1234 (cell) or ask Jose Melendrez at his store two doors away from the coffee joint on the east side of the plaza.